Please bear a thought for our staff. This festival is organised and run on an entirely voluntary basis by branch members. No-one is being paid, and every member of staff is giving up their time to help out. Why not join CAMRA at the products & membership stand, and play a part in future festivals, branch meetings, brewery visits and socials? Admission free until 3pm. £2.50 thereafter. 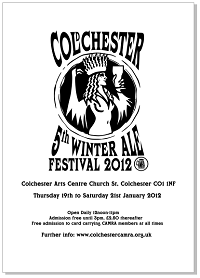 Admission free at all times to card carrying CAMRA members. 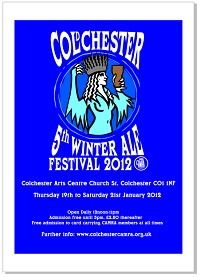 Download full colour or black and white posters to display and promote our festival. Thanks. The festival will offer 100+ beers from local brewers, real cider and perry. There will also be a Belgian bar offering draught and bottled Belgian Beers. English wines from Mersea Island Vineyard will also be available. Soft drinks will be available, free to designated drivers. NavaCross. An acoustic 'Folk Rock / Funk' band will be rocking the Arts Centre on Saturday night. See www.myspace.com/navacross for more info about the group and to have a listen to some of their tracks.